Traditional Halal Limited launched its halal certification scheme on Saturday, 1st October in Manchester at an event attended by Islamic scholars, community leaders, industry representatives and media officials. This certification scheme is categorically developed for meat and poultry that is produced without the use of stunning of any kind and is available for slaughterhouses, cutting plants, meat retailers, wholesalers, restaurants and takeaways across the UK offering a unique and distinguishable halal label under the name of Traditional Halal. Traditional Halal is a not – for – profit organisation governed by the Board of Islamic scholars and the Board of Trustees, and is led and managed by industry experts who have a proven record in animal welfare training, auditing, veterinary medicine, meat science and food safety. The launch was officiated by the HFA and the Halal Food Foundation (a parent charity of Traditional Halal and the HFA) in an attempt to enhance the welfare standards, training and skills in the non stun meat sector and to achieve further excellence in the halal meat supply chain with quality, consistency and sustainability. Dr Abdul Matin Khan, Chairman of Traditional Halal and the HFA, said: “we are fully committed to promote halal trade and to support the traditional way of halal slaughter”. Saqib Mohammed, Chief Executive of Traditional Halal and the HFA reiterated the need of advance training and enhanced competence in the halal sector, to meet the highest level of animal welfare and meat quality. Mohammed added: ‘we have developed animal welfare training for our supervisors, slaughtermen and site operators which will be offered to the applicants free of charge under this scheme’. All slaughterhouses and processing premises seeking Traditional Halal approval will be subject to constant on-site supervision, regular auditing, a stringent set of certification rules and transparent labelling regime. 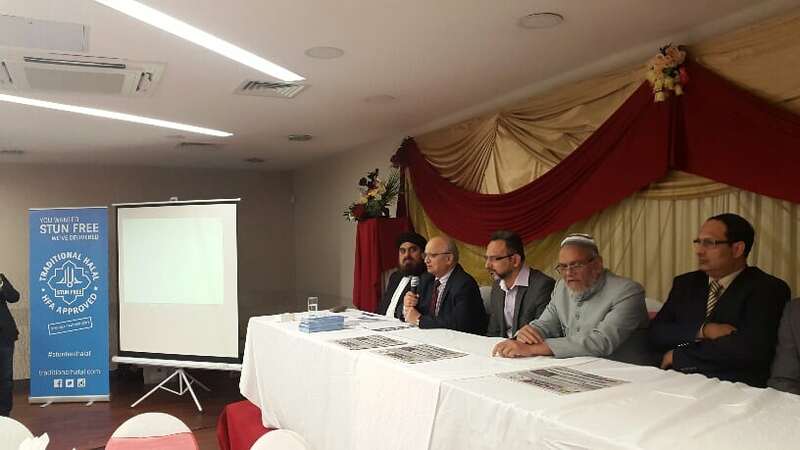 On the stage (from left to right) Traditional Halal Scholars’ board member Imam Sardar Qadri, Chairman Dr Abdul Matin Khan, CEO Saqib Mohammed, Head of Scholars’ board Mufti Abdulkadir Barkatulla and Trustee Ehsan Choudhury. The launch was fully supported by the attendees that include representatives of Euro Quality Lambs (Shropshire), Gafoor Pure Halal (Preston), Halal Kitchen (Bolton), Worldwide Cash and Carry (Rochdale) and Iqbal Poultry (Chesterfield) along with several Islamic scholars from Oldham, Blackburn and London. Traditional Halal certification will be providing sustainable choice, value and transparent labelling to assist consumers in making informed decision.